The example architecture requires at least two nodes (hosts) to launch a basic virtual machine or instance. 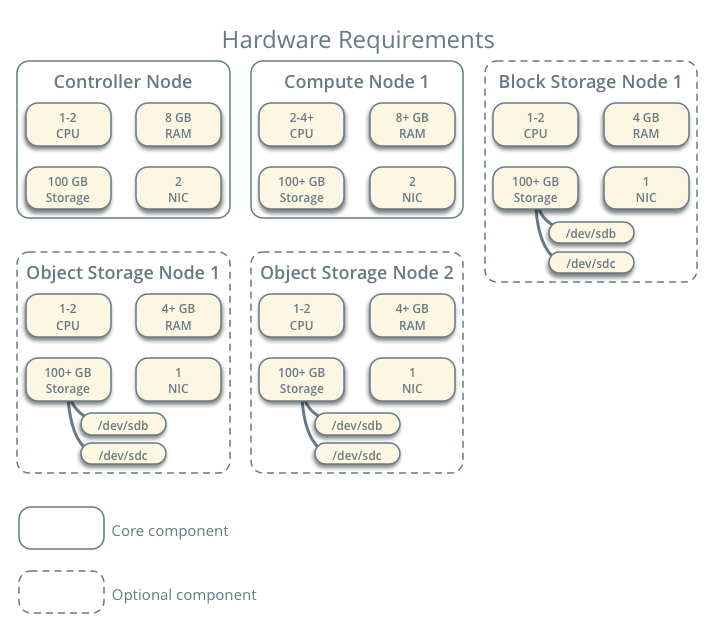 Optional services such as Block Storage and Object Storage require additional nodes. The controller node runs the Identity service, Image service, management portions of Compute, management portion of Networking, various Networking agents, and the Dashboard. It also includes supporting services such as an SQL database, message queue, and NTP. The compute node runs the hypervisor portion of Compute that operates instances. By default, Compute uses the KVM hypervisor. The compute node also runs a Networking service agent that connects instances to virtual networks and provides firewalling services to instances via security groups. 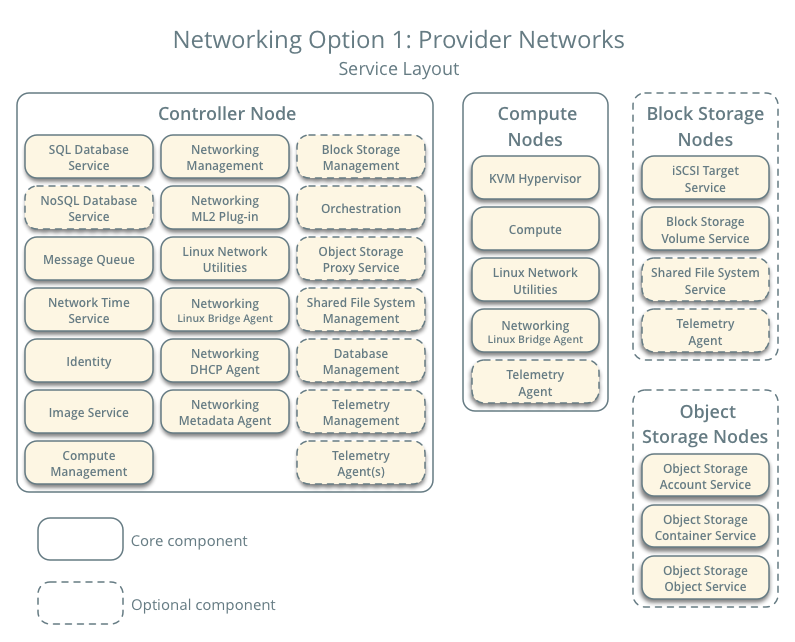 The provider networks option deploys the OpenStack Networking service in the simplest way possible with primarily layer-2 (bridging/switching) services and VLAN segmentation of networks. Essentially, it bridges virtual networks to physical networks and relies on physical network infrastructure for layer-3 (routing) services. Additionally, a DHCP service provides IP address information to instances. This option lacks support for self-service (private) networks, layer-3 (routing) services, and advanced services such as LBaaS and FWaaS. Consider the self-service networks option below if you desire these features. 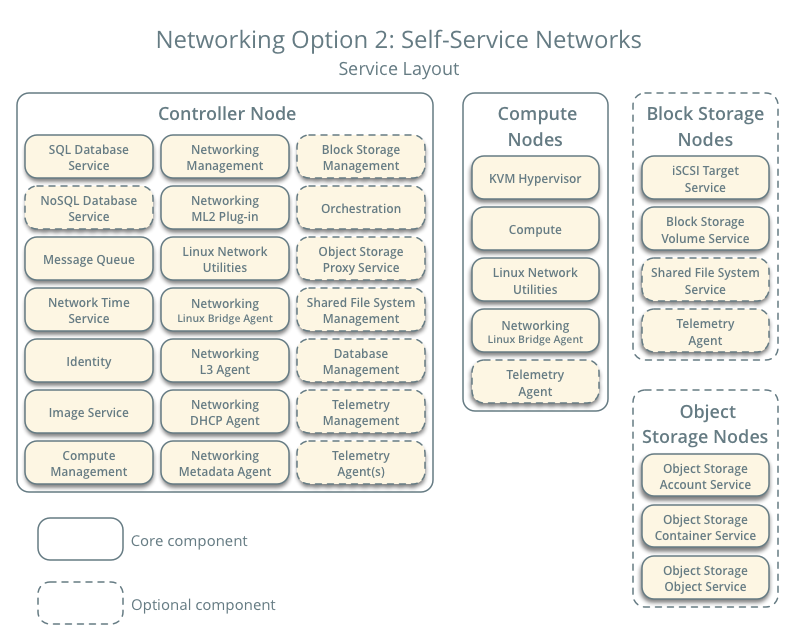 The self-service networks option augments the provider networks option with layer-3 (routing) services that enable self-service networks using overlay segmentation methods such as VXLAN. Essentially, it routes virtual networks to physical networks using NAT. Additionally, this option provides the foundation for advanced services such as LBaaS and FWaaS.